Let’s start with what MIG welding means. MIG stands for Metal-arc Inert Gas. From the name it’s clear that this welding process uses an electric arc, which springs directly from the filler metal, and the inert gas to protect the weld pool from oxidation. This process is part of wire feed welding and enables achieving excellent productivity. The welding torch feeds both the wire, through which runs the current generating the heat required for welding, and the inert gas, which shields the pool and prevents the formation of slag as the bead is created. The high heat input generated by this type of welding can create hot cracks that need to be corrected so as not to compromise the overall seal of the bead. Insufficient temperature can also lead to issues due to the lack of uniform welding and therefore poor penetration. Before starting to weld, it is necessary to adjust all the parameters of the generator in order to have a setting suitable for the type of work, since increasing voltage and current results in an increase in the temperature of the weld pool. Indeed, in the case of very high temperatures, the need for quick and effective cooling increases significantly. If we examine the arc welding formula H= η VI/v, it’s clear that with increased feed rate, heat input decreases. Therefore, the more skilled the welder, the faster he or she will progress when needed. If we add an advanced machine in terms of software to assist him or her, the welding will be of high quality. In addition to using a gas suitable for the type of welding, it is very important to keep an eye on the quantity of gas coming out of the torch to ensure that the weld is always protected. If there is not enough gas coming out, oxygen can reach the weld pool and lead to porosity. Oxidation can also take place when the flow of inert gas is increased too much, generating turbulence that includes air rather than keep it away from the weld. To avoid the defects typical of this type of welding and increase efficacy, technologies have been developed that digitally control the settings for MIG welding that we have discussed thus far. READ ALSO: "Why choosing italian welding machines manufacturers"
The welding process with digital control of the pulsed current provides significant advantages. The modern generators for MIG/MAG welding enable selecting different waveforms, which ensure an even transfer of metal and perfect penetration. By simplifying the pulsed arc transfer process, we can imagine it working through a base current, which flows from the wire to the piece, of sufficient intensity to generate and maintain the arc, followed by a peak that makes the droplet detach. The penetration of the deposit is determined by the peak current, while the heat input of the weld pool is related to the value of the effective current. The latest-generation inverter generators feature a display on which it is possible to select various waveforms, depending on the work to carry out. The versatility and ease of use of these digital MIG welding machines is clear since, with a quick glance at the screen, the welder can be guided in adjusting all the parameters. By using machines with cutting edge software, work is faster, and weld beads are aesthetically and functionally better. As mentioned, MIG welding is ideal when we want to work faster while maintaining a high quality standard; if we also use pulsed-current, the advantages are even greater. Pulsed-current MIG welding is used on thin sheet metal, light alloys and non-ferrous alloys, stainless steel, aluminium. This particular welding method solves a series of issues, such as inclusions in the bead due to improperly managed current and burn-throughs in the sheet metal due to too much heat. The evolution in the MIG welding process has today led manufacturers to create specific solutions to facilitate some types of processing that are particularly complex. 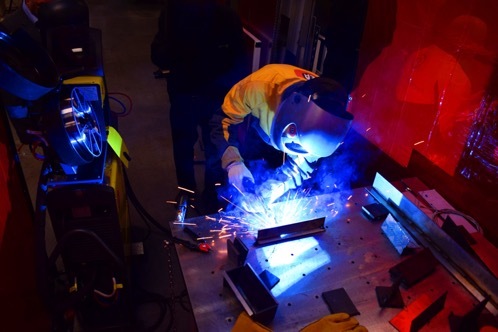 Other tangible benefits are given by the possibility of automating welding systems, partially or completely, using machinery that works with the human operator or fully manages a robot. Given the revolution that industry has been undergoing in recent years, having machinery that helps increase the efficiency of workers is essential. Having the opportunity of integrating modern automation technologies with machinery already at the company, what’s known as retrofitting, provides an opportunity to face industry 4.0 while avoiding huge investments.